I use lots of old film cameras and I’ve had to patch them up and unstick them, coaxing them back into useful life so I can go out and capture a little light. As time went on I realised that not everyone is quite so keen to grab a screwdriver and prise their lovely but defunct camera apart in the hopes of fixing it. And the cost of a ‘proper’ repair is often more than the value of an old beauty or a trashy toycam. I’ll do the best I can to sort out your camera. I’m not factory trained, nor do I have a huge barn full of spares, but I’m smart, careful and I love mechanical cameras. I’ll treat your cameras like my very own. So far I have had an extraordinary hit rate helping people – so good that I thought maybe I would spread the word and start charging a very minimal fee. 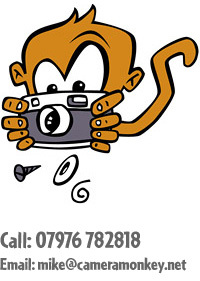 So welcome to Camera Monkey, a relaxed and personal service to help get your old film camera back on it’s feet and into your hot impatient hands. Two of my first customers were Lomokev and James Kendall, both lovely lovely people and also darned good photographers. Check them out on Flickr and feel free to ask them how good/slow/helpful/cheap* I am.